Dental sealants are plastic coatings that are usually placed on the chewing (occlusal) surface of the permanent back teeth — the molars and premolars (small molars) — to help protect them from cavity formation. The chewing surfaces of the molar and premolar teeth have grooves — “fissures” — that make them more likely to get cavities. These fissures can be deep, difficult to clean, and can be narrower than even a single bristle of your tooth brush. Plaque sticks in these areas creating the environment for cavities to form. 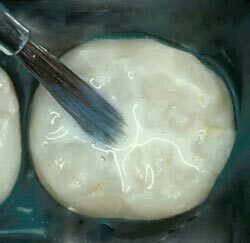 Dental sealants provide extra protection for the grooved and pitted areas by creating a smooth surface covering over the fissured area. When is the best time to have dental sealants placed? The best time for dental sealants to be placed is when the tooth first completely emerges from the gum. This way there has been little chance that a cavity has started to form in the grooves of the teeth. This early protection can help us get through times when we really don’t brush or take care of our teeth as we should. Molars are often the recipients of this treatment. However the smaller molars (premolars) can benefit from this preventive measure as well. Dental sealants are usually placed on the chewing surfaces of these teeth because these are the areas and teeth that typically have deep fissures (grooves). Dental sealants are sometimes also used on other permanent teeth if they have grooves or pits, to help protect these surfaces. First, the tooth surface is thoroughly cleaned with a paste and rotating brush by your dentist or hygienist. Next the tooth is washed with water and dried. Then a solution that is acidic is placed on the fissured area of the tooth’s chewing surface for a number of seconds before being rinsed off. This creates small microscopic areas with a fine rougher surface than the surrounding tooth enamel, that can be seen with a microscope. The cleaning or roughening of the tooth is what allows the sealant to stay in place. After the tooth is dried again, the liquid dental sealant is placed on the tooth and hardened. Dental sealants are hardened by using a special blue light. Once the dental sealant has hardened it becomes a hard plastic coating, and you can chew on the tooth again. In some cases it may feel a little funny when you bite down but within a day or so this evens out and feels normal again. Dental sealants have been used and have been proven to be effective since the 1970s. Many studies have shown that they are effective in helping to prevent decay on chewing (occlusal) surfaces. Typically dental sealants last many years even for the life of the tooth. This is a good way to protect unnecessary tooth removal due to dental decay in the future.